The unique 3.6K Cylinder offers SoftSuns’ renowned natural illumination and extraordinary color rendering in the widest angle coverage available. The 3.6K is the first head to provide an ultra-wide beam spread of 100 degrees in all directions. 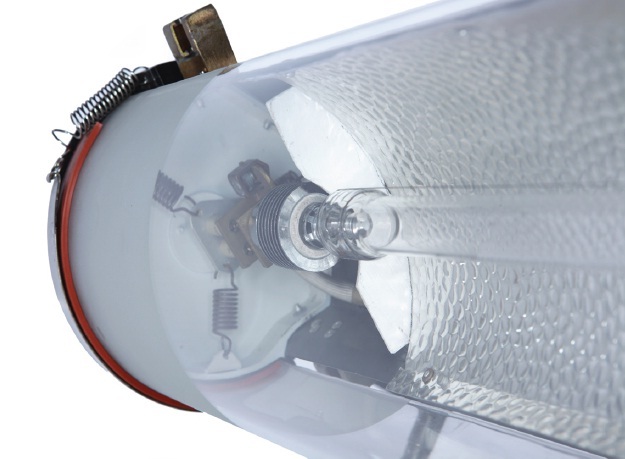 Its light weight (only 21 pounds) and compact ultra-low profile (featuring a glass tube enclosure of only 6” in diameter) make it ideal for mounting on a moving vehicle or lighting hard-to-reach spots without being seen by the camera. In the movie “Serenity,” it was built into the futuristic set to be seen on camera. Balance 5000 degrees Kelvin interior light with exterior daylight with the powerful 3.6K Cylinder by easily placing it out of sight just outside a window, over a doorway, over a window, in a corner or any tight constricted space. Both the 3.3K and 3.6K units share our generation III power supply. This unit offers quiet, reliable operation in a light-weight, easy to use, rugged weather-resistant package. The power supply also features built-in DMX and accurate digital light level readout.